In the ever evolving world of liquid alternatives, it can be difficult to digest all of the information and decipher your best options. MAPs give investors the ability to invest in top-tier macro, managed futures and hedge fund managers at much lower minimums then directly investing through managed accounts. MAPs offer enhanced liquidity when compared to traditional fund investments. This varies from daily to weekly liquidity without a lock up period. To further offer the same benefits of a managed account, MAPs provide the ability to notionally fund a pooled investment. This allows investors to apply a degree of leverage to their investment. It can be frustrating to watch the market whipsaw while you wait for your monthly fund performance statement. With MAPs you can log into your account whenever convenient and see the daily valuation of your investment. 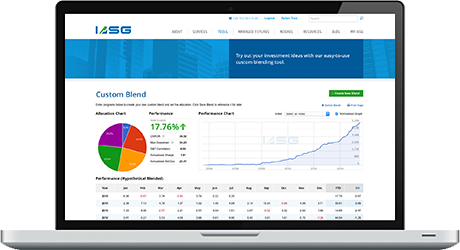 Our team at IASG Alternatives look forward to walking you through the options that Managed Account Platforms offer your portfolio. Every investment has unique risk and benefits to consider, we want to arm you with the knowledge to make an informed decision. Please do not hesitate to contact us for more in-depth information and a detailed assessment of your personal portfolio.